My Xbox One now available in ebook and paperback formats! My Xbox One (2014)We're happy to announce that our latest book, My Xbox One, published by Que, is now available. You can check out the book, including sample content (which includes the front matter, Prologue, Chapter 3, and the index! ), by going to the Pearson/Que Website (here). They have both the ebook and paperback versions available, as well as special bundle pricing. Of course, both formats are also available at booksellers everywhere, including Amazon, though it may be a few more days before the paperback shows as in stock (be sure to use the Look Inside and send a sample to Kindle features on there as well). As for the book, think of it like the missing manual for the Xbox One, providing visual, step-by-step guidance and tips for getting the most out of Microsoft's latest and greatest game console and media/entertainment center powerhouse. Let us know what you think, help spread the word, and, as always, thank you for the support! In this video I demonstrate my special (multi console) Soul Calibur II Fight Stick and play the Japanese game on my original Xbox console. Heck, I even try to pronounce the Japanese name for it. It is easily one of the graphically best looking games on the Xbox, really showing off what the device is capable of. My Xbox One (2014)In preparation for working on our upcoming My Xbox One book, Christina and I thought it would be a good idea to check out Microsoft's Xbox One console prior to its official November release. 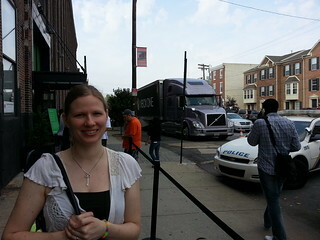 Thanks to the One Tour, we had our chance today in Philadelphia through an Area One party. Basically, what this meant was that we had to pick one of the three hour blocks of time, wait in line, and hope we could get in to experience "live music, live gameplay, and more..." Naturally, we were most interested in the live gameplay part. Once inside the large warehouse area, we were treated to our choice of multiple game areas where we could sit or stand and play some of the Xbox One launch and launch window titles, which included: Crimson Dragon, Dead Rising 3, Forza Motorsport 5, Killer Instinct, LocoCycle, Ryse: Sone of Rome, Max: The Curse of the Brotherhood, Zoo Tycoon, and Kinect Sports: Rivals. Christina waiting in line to get in. Note the Xbox One truck. Microsoft unveils the next Xbox: Xbox One - What they said and what it means! 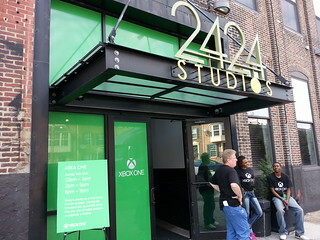 While we had a previous poll and some thoughts and speculation on the next Xbox here at Armchair Arcade (among many other thoughts from staff and other commenters), it's now time to discuss the reality from today's #XboxReveal, with Microsoft the last of the three to play its next generation hand. As you no doubt already know, Nintendo's Wii U is struggling mightily, while Sony's PS4 has a lot of positive buzz so far and will be released around the same time as the new Xbox (Xbox One). With all that said, let's take a look at what was just unveiled. On Tuesday, May 21, we'll have the next Xbox announcement. Nintendo has obviously already played their hand with the Wii U, an intriguing, but possibly failed gamble on a mix of current gen technology with tablet paradigms, and Sony has shown much of what they'll be offering with the PS4, a "social" next gen console that emphasizes its access speed for everything from updates to getting to play games/demos without much, if any, delay. Interestingly, Microsoft was first out of the gate this current generation, but will be last to make their announcement thanks to positive momentum in the past few years (everywhere except Japan, of course). Written by the now gone Bizarre Creations, Geometry Wars originally could be found on the original Xbox was a mini game within the Project Gotham Racing 2. This game is the sequel to it and it was the most downloaded game on Xbox Live on the 360. For me this game was the must have game for the Xbox 360. Check it out. The Sequel Geometry Wars: Retro Evolved 2 was released on the 360 but also on the Wii and the DS. There's also a version out on iOS. MIND YOU: This clip has some loud noises so you'd better not use headphones while watching this. Sound quality is not the best as the microphone had some issues that couldn't be fixed in post.